Burray is one of the Southern isles on the East side of Scapa Flow linked to the Orkney Mainland by the Churchill Barriers. I have been living on Burray since August 2012 and this blog is about the birds (and other wildlife) seen around island. Birds listed in BOLD are first sightings of the year on Burray and UNDERLINED first sightings of the year on Orkney. So I made it to the 6th of January before failing in my bid to keep the blog up to date this year. This was recently pointed out to me by my friend Martine so in an attempt to catch up, here is a round up for the rest of January. I have to say that overall it was a very quiet month even for the common garden birds. Of course at this time of the year the weather generally wasn't up to very much with snow on the 23rd and 28-30th. It wasn't too heavy but left a thin coating and kept the birds hiding in the bushes. Following Christmas the Greenfinches disappeared completely as did House Sparrows until the week commencing the 20th (based on the BTO Garden Bird Watch calendar) when three appeared rising to five the following week. Starlings were a bit more consistent appearing every week peaking in the week commencing the 20th when there were 35. The other consistent species was Blackbird where a ringed female and one or two ringed males appeared every week. It was dark when traveling to and from work so I wasn't able to stop off at Echna Loch or Echnaloch Bay to see what was about. The highlight for me this month was on the 28th and it wasn't even on Burray. I had gone to work and left some documentation behind so I had to come back for it. On my way back home I was driving along the Old Finstown Road when as I approached the junction with the link road through to the main Kirkwall/Finstown road a smart male Stonechat popped up onto a fence post at the side of the road. Whilst I didn't keep up to date during January as you can see there was very little to report. It's still very quiet in the garden so far this year, apart from a pair of Blackbirds (both ringed) and a few Starlings sand Rock Doves all the other species usually seen are noticeable by their absence. Today really was the calm before the storm with very little wind and some welcome sunshine. I took the opportunity to take a wander up to the top of the hill behind the cottage and down the far side to some pools and heather moorland. As I set off two Ravens flew over heading to the East. As I turned up the track to the trig point the honking of some Greylag Geese sounded the alarm to my approach and soon after two small flocks took to the air. Apart from a few Starlings the walk to the summit (I can't call it a climb as there is only about 20M of height between my cottage and the summit) was also very quiet. It won't be long before the Meadow Pipits return to breed. As I passed the trig point and started to drop down the other side of the hill the land changed from grass fields to heather moorland. Usually there would be Meadow Pipits, Skylarks ans Greylags all calling and watching my every move but today there was nothing. As I got a bit lower the pools at the bottom of the hill came into view. A scan with binoculars showed that these too very empty of birds. I got the feeling today wasn't going to be a very productive day but the year is young and there will be lots of opportunities to see something. The area I was now standing in was once the site of a gun battery, part of the defence system for Scapa Flow. Apart from the remains of the gun emplacements all the buildings bar one are all gone and just the bases are left. As I approached one of the bases there were three Starlings perched on the top of a concrete post chattering away. Unlike most Starlings these didn't move away as I approached they just sat tight. Eventually one flew a short distance away but the other two stayed where they were until I was about six feet away then they took off, flew in a circle behind me and landed on the ground just in front of me. Then I remembered that this was the base that last year I hear a lot of chirping coming from a hidden cavity and I had watched the Starlings coming and going and bringing food in for the young. So they were back a getting ready for this year's breeding season. The walk back to the cottage was a more gentle climb rather than the steeper ascent if I had gone back the way I came. On the fence line I spotted a Hooded Crow and on the field behind it there were two Ravens. About half way back to the cottage I heard the familiar call of a Meadow Pipit coming from the heather, so there was at least one back on suitable territory. A bit further along the track as I was approaching Windyha (a bungalow) I spotted a Robin sitting in the bush by the gate. Then as I approached Saorsa (another bungalow) I spotted a young Rook foraging in the field. As I walked the last few yards back to the cottage a flock of 10 Curlew flew overhead and disappear down towards the village. So not a big list of species but another three added to the Burray year list and one to the Orkney year list giving me totals of 35 and 41 respectively. This morning was my first proper chance to get out and have a look around part of my Burray patch. So I decided to focus on Echna Loch and Echnaloch Bay and to the North up to Barrier 3 and Northfield. Before I set off a quick check around the immediate area surrounding my cottage only produced a male Blackbird in the garden itself, 14 Starlings sitting on the overhead electric cables from my paddock and 17 Common Gulls feeding on the field next to my paddock. At the bottom of the hill there were circa 70 Lapwings feeding in one of the fields belonging to Ruemera. On arrival at the parking area between the loch and the bay I started with a quick scan of the bay. This produced 10 Red-breasted Mergansers, 2 Common Gulls, 2 juvenile Herring Gulls and 6 Shags. I then switched focus to the other side of the road and had a scan around the loch. The Mute Swans that I had seen on New Year's Day had been replaced by 2 juvenile Whooper Swans. I also counted 17 Mallards, 4 Great Black-backed Gulls, 300+ Greylag Geese, 25 Tufted Duck and 3 male and 2 female Goldeneyes. one pair were busy with courtship display. Near to the Southern edge of the loch I spotted 3 Little Grebes diving amongst the weeds. Overhead a flock of 50+ Lapwings flew over coming from the direction of the flock I had seen earlier. Alerted by their calls I spotted a pair of Redshank flying low over the loch. Back over on the bay side a further scan produced 10 Fulmars along the cliffs, now back on territory after the high winds at the start of the year. Out on the water there were at least 60 Long-tailed Ducks and in amongst them I spotted 4 Slavonian Grebes and a male Eider. Further out there was a large raft of Shags. I then moved on to Churchill Barrier 3 for a quick look at Weddell Sound. On arrival at the car par there was a Hooded Crow in the field next to it. Usually these birds tend to fly off when you get close but this one didn't move too far away. There were 2 Shags diving along the side of the barrier itself and further out into the sound there were a couple of Cormorants. Near the shore line there was a flock of 20+ Starlings feeding in the undergrowth. Next I moved up to Northfield by the wind turbine. There was a solitary female Mallard on the pool but a close scan around the water's edge revealed a Snipe by some rocks doing its best not to be seen. I then returned to the loch, this time going round to the far side. Here a Snipe took off from close to where I pulled in and out on the water 8 Teal started swimming away from the water's edge further out into the loch. Finally before heading home, a quick stop at the village shop produced 8 House Sparrows in the garden next door to the shop. So a good morning's bird watching adding 11 new species to the patch year list. Totals for 2019 are now 40 for the Orkney list and 32 for the Burray list. Today I had to drive between work's Stromness and Kirkwall offices. First time I have been able to do this run in daylight this year. As I left Stromness and drove up over Howe Brae I encountered a couple of Pied Wagtails running around in the middle of the road. As I turned onto the main road at the bottom of the brae I was hoping to spot Oystercatchers and Redshank on a small islet on the loch side of the road but it was empty. There was no sign of the otters by the Brig O'Waithe either. Once clear of Finstown and heading towards Ingashowe on the sea side of the road there are some very low (less than 10ft) cliffs which hold a small breeding population of my favourite sea bird and today I saw four of them flying back and forth along the cliff edge. So that added Fulmar to my Orkney list too. I was expecting to see this species on the higher cliffs on the North side of Echnaloch Bay on New Year's Day but I think the strong winds had forced them of the cliffs and out into Scapa Flow, so I still need them for my patch list. Weekend tomorrow, forecast isn't looking too bad dry with Force 4-5 Westerly winds on Saturday veering round to the North-West on Sunday and decreasing during Sunday to be Force 1-2 on Sunday afternoon. Then there is a big blow (currently forecast to be Force 10-11) coming in for overnight Monday into Tuesday!! Today I was back to work over in Stromness. Leaving home in the dark and coming home in the dark didn't give much opportunity to add anything to the list today but a quick visit to my car at lunchtime to get my lunch gave me three Rooks sitting on the roof of the Old Academy building and a Robin singing from a tree on the other side of the car park. So that takes the Orkney list up to a nice round 30. It will be the weekend before I get another chance to take a look around my Burray patch. It's the 1st of January 2019 so it's time to wish you all a Happy New Year and I hope you all have a great year of nature. As 2018 finished with gales and some heavy rain in the last couple of hours, the new year started with strong winds that slowly decreased as the morning progressed. Having got off to a good start last year with my blog, it didn't continue throughout the whole year due to a number of other things going on making time to add to the blog short. I do want to go back and at least put something in for the months I have missed, hence the monthly placeholders in the blog listing. This year I want to try and do better with the blog and I'm also planning to spend a bit of time looking at the other flora and fauna within my property here on Burray so I will post about what I find. After a friend of mine, who is also a Burray resident, started looking at what was in his garden last year, it became clear that there is a lot of natural history being under reported here in Orkney. So hopefully in 2019 we can contribute some useful data to the various recorders to give a better picture of what is here in Orkney and whether any of it is new to the islands. Is this a sign? 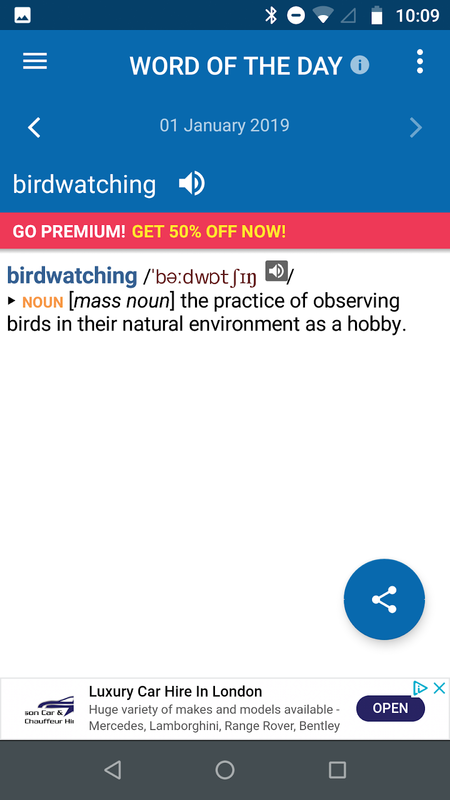 My Oxford Dictionary of English app on my mobile phone says that today's word of the day is 'Birdwatching'!! Better get out there and see what's about. The 2019 lists started at 8 am when I opened the cottage door and took a listen. Despite the noise from the force 6 wind it wasn't long before I heard and saw the silhouettes of two Greylag Geese flying over the cottage, quickly followed by 12 more. It nearly an hour and a half, after a non-exciting first sunrise of the year, that the next birds to be seen were a small group of Rock Doves, regular visitors to the garden. Looking out towards the third Churchill Barrier a flock of 11 Starlings were struggling against the wind as tried to fly over some of the fields. Movement out of the corner of my eye bought my focus closer to home as a female and male Blackbird both entered my ground trap to feed on the seed and apple that I had put out. Both were ringed so I left them to their breakfast. Looking back out towards Barrier 3 I spotted a Gannet flying over the sea along the Flow side before it pulled up, turned and dived into the water. Despite the distance, the bright white plumage with black wing tips and the manner of flying made it easily identifiable. To the West of the cottage a flock of 12+ Greylag Geese were feeding in the field. To the East a single Lapwing was seen flying past Hillhead and down the hill. I suspected I would be seeing more of them on my way out later. Attention was quickly bought closer to home as a small flock of Rock Doves flew quickly pas the cottage and out over the small area of heather we have. In hot pursuit was a Sparrowhawk but despite its chasing the doves evaded attack and the Sparrowhawk was seen carrying on over the fields towards the village. Mid-morning a Raven was seen in a field to the North of the cottage foraging on the ground. I suspect it had company, as usually they go around here in small groups, but they were over the brow of the hill and out of view. An un-ringed Blackbird appeared in my ground trap, grabbed a piece of apple and quickly dragged it outside of the trap before I could drop the doors. Just before midday we set off to visit a couple of friends in St Mary's village just the other side of the first Churchill Barrier. As we set off down the hill to the main road we passed a small building plot which had three Hooded Crows feeding. In the field on the other side of the road was a flock of eight Lapwings and 20+ Starlings. Next a quick stop in the lay-by to take a look on Echna Loch. There wasn't too much about because of the strong wind but still managed to add an adult and two juvenile Mute Swans, a single Great Black-backed Gull, five Tufted Duck, a smart male Goldeneye, two Common Gulls, five Mallard and four Wigeon. On the other side of the road the wind was coming straight in off the Flow into Echnaloch Bay so the sea was quite choppy making it difficult to spot things. A single Great Black-backed Gull and two Common Gulls out over the sea was about it. But just as we were driving off a single Curlew landed on the shore. Next up was a quick detour round the back of the Fossil Centre as I had spotted a large flock of birds on the field next to it. As well as eight common gulls and approximately 70 Lapwing the was a flock of at least 220 Golden Plovers. A quick stop next in the lay-by at the Burray end of Barrier 3 produced three more Great Black-back Gulls, another Gannet, a Curlew, a female Eider, a male Long Tailed Duck and a Shag. Once over Barrier 2 a quick check of the Shag's congregating on the Lamb Holm pier for any colour ringed birds but none of the seven present had any. While checking a pair followed by a flock of seven Jackdaws flew past. While crossing Barrier 1 we passed an adult and two juvenile Herring Gulls sitting on the concrete blocks and two female Eiders and a Great Black-backed Gull out on the sea. While at our friend's house we saw House Sparrows, Collared Doves, a Wren, a Dunnock, a Greenfinch and some Starlings. So at the end of the first day of the year my totals were 21 for the Burray list and 28 for the Orkney list. To be updated soon, honest. I'm fortunate to live in Orkney, a place which some describe as bleak and barren but if you know where to look there is plenty of nature to explore and enjoy. I hope to share some of this with you.